Pumpkin picking is not just for kids! 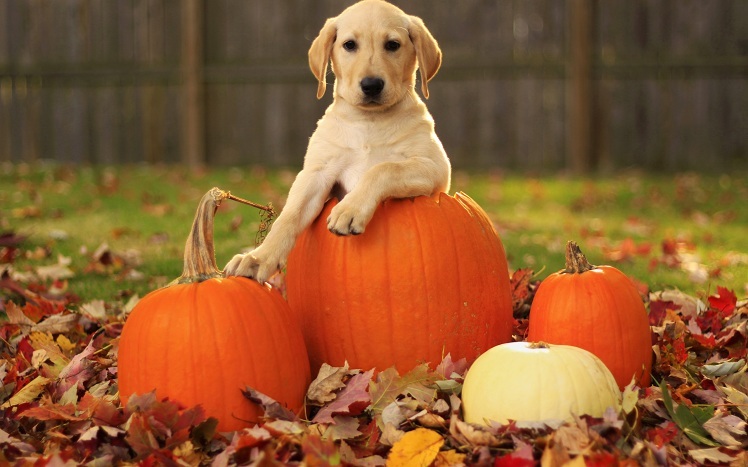 Some pumpkin patches also allow pooches as long as they are leashed. Pumpkins have more uses than just Halloween jack-o-lanterns. They are a great source of fiber to help regulate and maintain a digestive tract as well as providing an excellent source of Vitamin A. Try making some dog treats out of fresh pumpkin! That’s right, it’s football season! Tossing the football around the backyard? Include Fido in your outdoor football game. Tailgating? Bring him with you so that he can socialize too. Just remember to set up near a grassy patch so he has somewhere to relax. Who doesn’t like to take a long walk in the fresh, clean, crisp air? Most national parks are not dog friendly, however many state parks are as long as your dog remains leashed on trails, picnic areas or campgrounds. Check with your local state park to see if there are restrictions. Park pet regulations vary even within the state. Dogs crave adventure as much as we do. A variety of experiences will keep your pup active and alert. Camping is an excellent way for your dog to have new experiences. Your dog’s vaccinations and IDs should be up to date and will most likely need to be required by the campground to camp. Once again, check with the pet regulations of the campground before you go. You loved this when you were little and no doubt so does your pup! Before bagging up a pile of leaves, let your dog jump in and toss around leaves with you and the kids for family fun. Did you know some wineries in Napa Valley are pet friendly? It’s possible that some of your local wineries are too. While some wineries do not allow pets due to health codes, allergies, etc., some do welcome dogs. Most websites will clearly state that dogs are not allowed on the premises. However, if the website does not state their pet policy, it may be worth making a call to check. Another fun fall activity for you and your four legged friend, apple picking. Some orchards allow dogs on the premises as long as they are leashed and you promise to pick up any messes immediately. Make sure to call your orchard ahead of time and find out the dog policy. Apples are healthy treats for your dog as well. They are great sources of vitamin A and C as well as fiber. Plus, apples are great natural teeth cleaner for your pooch’s pearly whites. Of course, this is probably the first activity that comes to mind when talking about fall festivities. Halloween can be a fun but also an anxious time for your pet. With large crowds of costumed people walking through neighborhoods, the door bell ringing and knocking at the door every few minutes, your dog might go a little crazy.